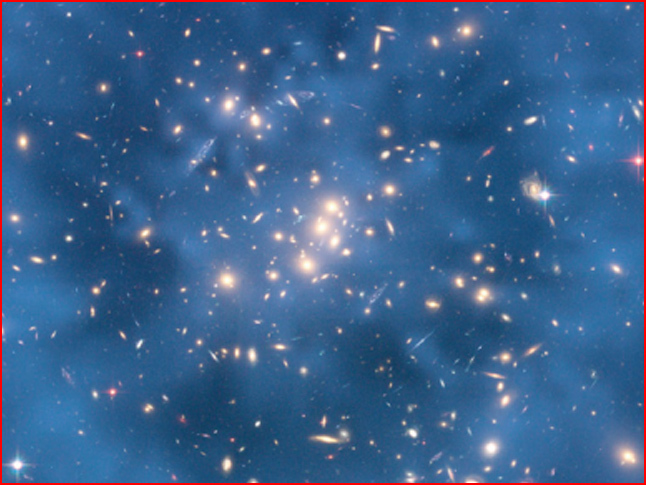 Galaxy Cluster CL0024+17 with an overlay showing a supposed dark matter ring. Images from the Hubble Space Telescope have revealed a so-called "ring of dark matter" circling a galaxy cluster. Does dark matter exist? Or is electricity a better explanation for the structure of the universe? "Our own galaxy should have fallen apart by now," said Frederic Bournaud, an astrophysicist with the French Atomic Energy Commission (Commissariat a l'energie atomique). "So dark matter - this unseen force - is somewhere keeping it glued together." The gravitational force exerted by this unseen and undetectable material is sustaining not just our galaxy, but all galaxies. Astronomers have long been dismayed by the lack of matter that can be observed in the visible universe. According to conventional theories, it was the "big bang" that brought all matter and energy - including gravity - into existence, so their postulates about dark matter must fit within the confines of that hypothesis. Every modern cosmological theory has the "big bang" at its core. For many years, investigators tried to reconcile the lack of mass, particularly in galaxy clusters, with the expansion of the universe and the acceleration of that expansion. There is, apparently, not enough gravity available in observed matter to account for the excess speed and the consolidation of both individual galaxies and their bunching together. In 1933, Fritz Zwicky was studying the Coma Cluster of galaxies and found that his calculations for orbital acceleration and stellar mass within it was off by a factor of about 160. He concluded that there must be something invisible to his instruments somewhere within the cluster that was holding it together. His hypothesis was supposedly confirmed in 1979 with the discovery of 'gravitational lensing' (another theory of Dr. Zwicky) and the "twin quasar" QSO0957+561 A. In the image at the top of the page, the blue rays are actually a map of distortions in the shape of the galaxies within the cluster. The distortions are like ripples on the surface of a lake, according to astronomers. As the ripples shift over the stones and plants, they cause their shapes to deform because the light from above passes through regions of varying density. In the same way, NASA scientists think, the ripples in a dark matter halo are what is passing through CL0024+17. This conclusion is an artifact of Zwicky's "gravitational lensing"; since it is actually instability in the gravitational presence of unseen matter that is supposedly, 'bending light' around and through the galactic cluster over five billion light-years away. Since "dark matter" is unseen and undetectable and can be analyzed through inference alone, could it be that something else is taking place? Something that NASA and the ESA observers have failed to consider as an active force? That "something" is electricity. Because "there is electricity in space, but it doesn't do anything" is the mantra of current cosmological and astrophysical theories, then the mysteries of the universe will continue to rely on explanations that seem to have more basis in fantasy than reality. From the perspective of the Electric Universe theory, the clusters of galaxies, the galaxies themselves and their associated stars are all driven by electric currents flowing in dusty plasma over immeasurable distances. Birkeland currents create z-pinch compression zones between the spinning magnetic fields in the electrical vortex. The compressed ions form spheres of glowing plasma - some in arc mode, some in glow mode and some with variability between the two states. Circuits of electricity pouring into them from outside power the stars and galactic wheels. What should we expect to see in their shapes and behavior in that case? Around the galaxies and throughout the cluster will be Birkeland filaments that slowly fluctuate in their intensity, causing mass density variations that might be interpreted as gravitational effects. The plasma in which the galaxies exist creates radial magnetic fields as the current flows, interconnecting each galaxy with its neighbor and forming electrical bridges between them. Double layers form in plasma as the electrical charges isolate themselves from one another. They may break down if too much current flows in the circuit. In that instance, there will be a "supernova." Around the galaxies and clusters will be toroids, or rings of charged plasma. They are detectable in extreme ultra-violet, x-ray and gamma ray light. In the Hubble image of galaxy cluster CL0024+17, all of those phenomena may be witnessed. There is no need to resort to things that do not exist in order to explain the things that do exist.